The Real Estate and Housing Developers' Association (Rehda) of Penang is claiming that the high cost of land is the main reason for houses being sold at high prices in the state. Its chairman, Datuk Jerry Chan Fook Sing, said the high cost of land was also the reason for developers' inclination towards building upmarket homes in the state. 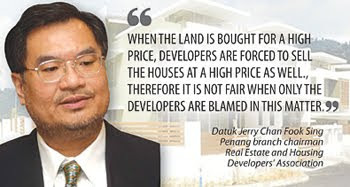 The limited land in Penang Island has caused landowners to sell their land at very high prices and this directly impacts the price of houses, he said. "When the land is bought for a high price, developers are forced to sell the houses at a high price as well. "Therefore it is not fair when only the developers are blamed in this matter," he told reporters in George Town yesterday. To ensure affordable housing prices for all levels of society in the state, the government would have to find a suitable mechanism to overcome the problem, he said. A recent report quoted Senior Fellow at the Social, Economic and Environment Institute (Seri) Dr Michael Lim Mah Hui as saying that the average price of a house in Penang was RM540,000 last year. The report also said the price of house in the state exceeded that of the average house price in Kuala Lumpur at RM390,000.